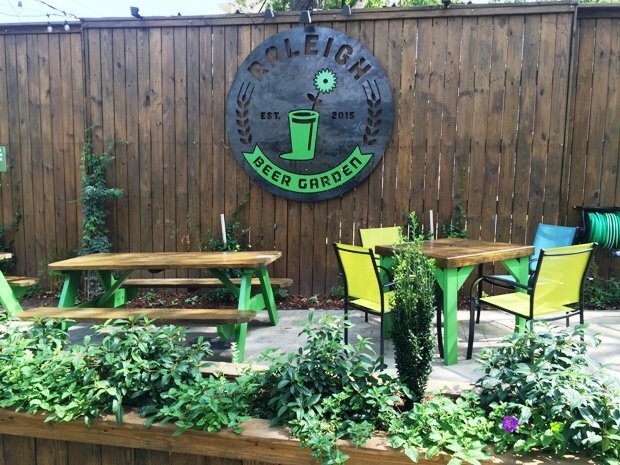 Raleigh Beer Garden, Setting World Beer Tap Records in Little Old Raleigh! It looks like the beer scene in Raleigh continues to grow unabated! Since I live right up the street from S. Glenwood I would pass construction for the Raleigh Beer Garden regularly. And I was wondering how we could support another bar focused on beer. 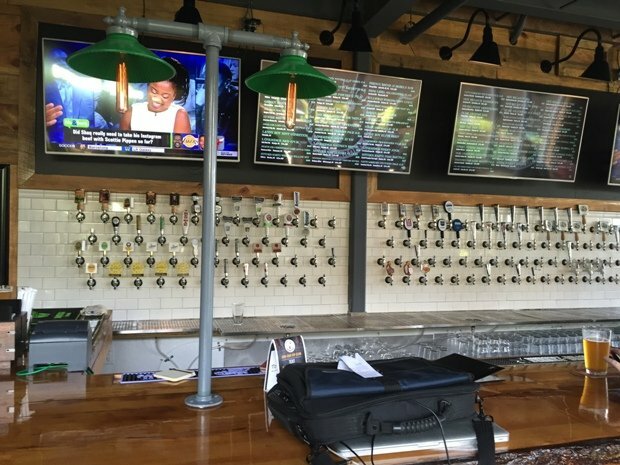 Then I heard about how Raleigh Beer Garden would have more than 360 taps for draft beer and I wondered, how many customers would be needed for all those taps in a space that size? Well my friends, after a first visit to Raleigh Beer Garden on opening day, I get it. 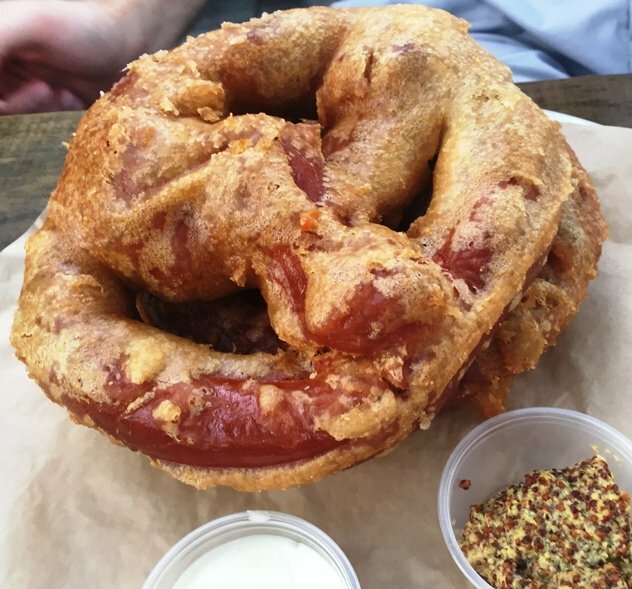 And while things are far from perfect at Raleigh Beer Garden, what they’re trying to do is pretty awesome. C’mon, let’s go check it out! From the street, Raleigh Beer Garden is pretty innocuous. Narrow street front presence, light wood planking up front with bright green signage, it feels a bit corporate. I head on in and there’s a hostess kiosk for most of the seating at Raleigh Beer Garden. There’s a covered front patio with bar but most people are inside on this steamy, hot day. 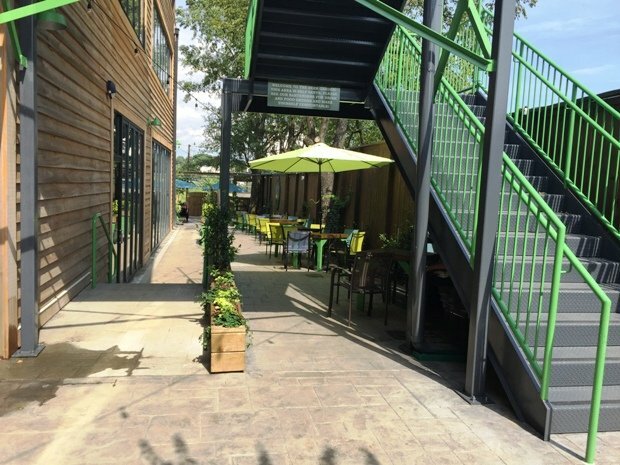 Running down the right side of Raleigh Beer Garden, you’ll find a pathway to a set of stairs for the third floor, along with some four-top’s leading to the backyard beer garden! Here you’ll find a slew of picnic tables under brightly covered umbrellas for cover, along with a raised platform area. The place is really nicely done with lots of green touches all around, supporting the garden theme. Take note, the tables in back are first come, first served along with bar seating! So if you don’t want to wait for an inside table, just grab a beer at the bar and head on out back. A lot easier given current wait times. Head on up the stairs to the third floor (which isn’t open yet) and there’s another small bar and light seating. 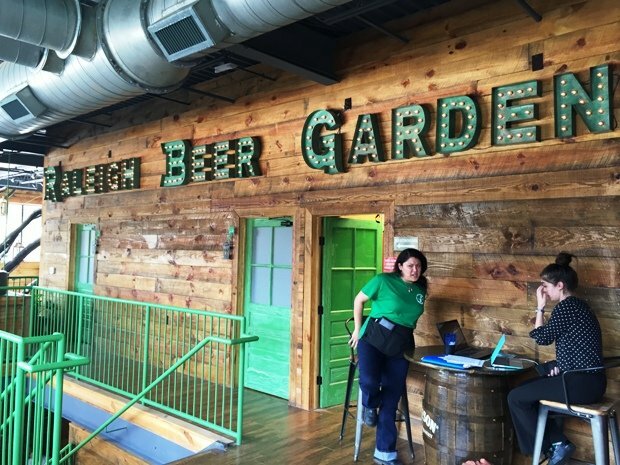 But hey, as impressive as the outside is, it’s time to check the inside of Raleigh Beer Garden! I head on back to the first floor of Raleigh Beer Garden and it’s a wow experience. Main liquor bar up front, NC beers in the back room. You’ll immediately be struck by the front bar which sits in an open, two-level space complete with oak tree installation. 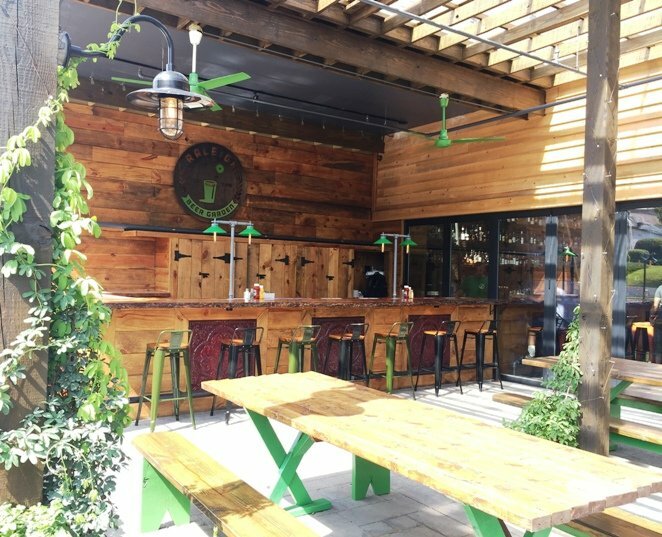 There’s a great sunny and organic feel to the place, they’ve obviously spent a lot of time and money thinking through the design of Raleigh Beer Garden. 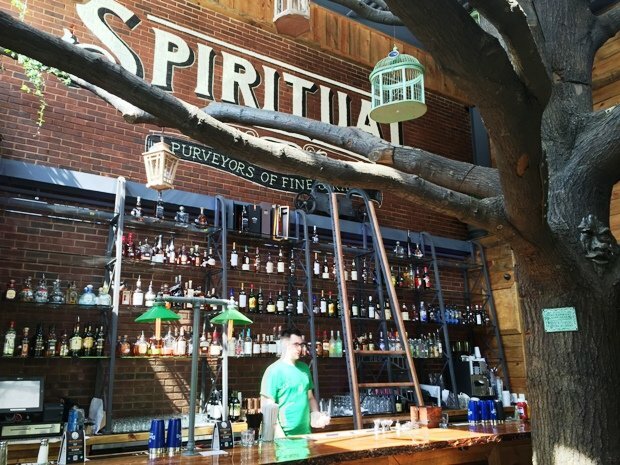 Bird houses hang over-head and the brick wall behind the bar sports some nice vintage signage along with a lovely sliding ladder for access to the tall liquor display. Pub stools in thickly-grained carved oak, line the bar area. And the front seating area sports some nice stuffed leather chairs for a change of pace. Heading into the NC beer room you’ll find a white, tiled back-splash behind the bar with a plethora of beer taps, whoa! HD panels overhead list the brews on tap. And there’s a LOT of them! 140+ downstairs and 220+ upstairs. 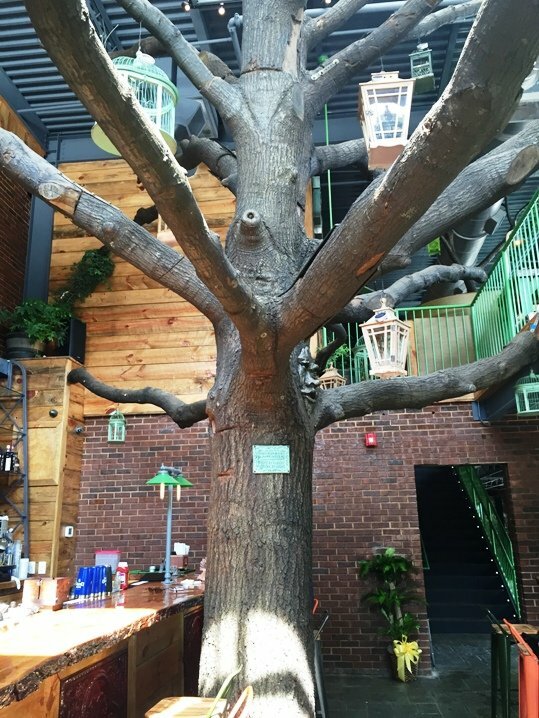 Forbes reports that the Raleigh Beer Garden is likely the largest beer garden in the world with the most beer taps. And I would have to believe them. 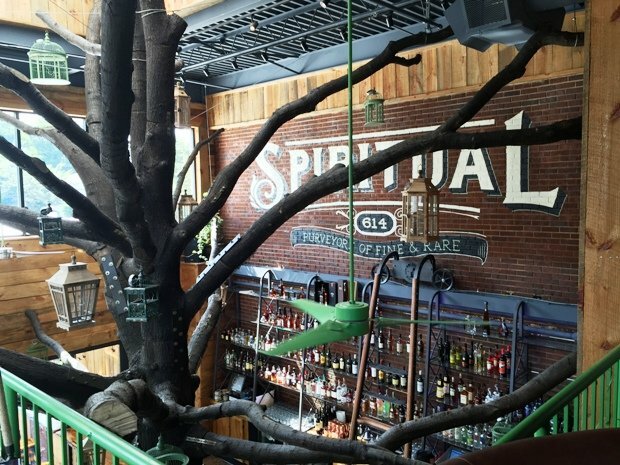 Moving to the second floor you’ll find a front dining area with the oak tree poking though and over-looking the liquor bar, very cool! Another planked passageway with Raleigh Beer Garden signage leads past the kitchen service area to the main back beer room. All the non-NC beers from around the rest of the country and world, we’re talking 220+ taps here. 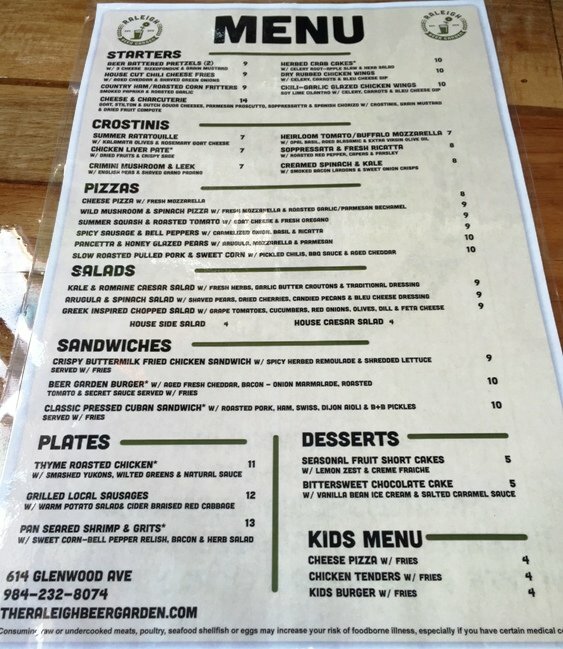 I grab a seat at the bar and check out the menu. It’s short and covers some apps, salads, crostinis, pizzas, sandwiches and entrees. 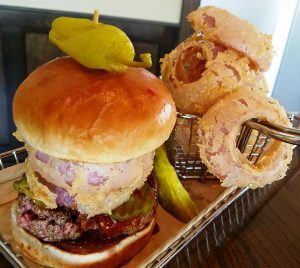 An odd mix of eats but I’m just visiting for a quick beer today! I’ll update this post when I can stop in for a meal. All in all the design and execution of Raleigh Beer Garden is wildly impressive. A great garden theme with plenty of green accents in the space. A HUGE selection of beers and seating across three floors. 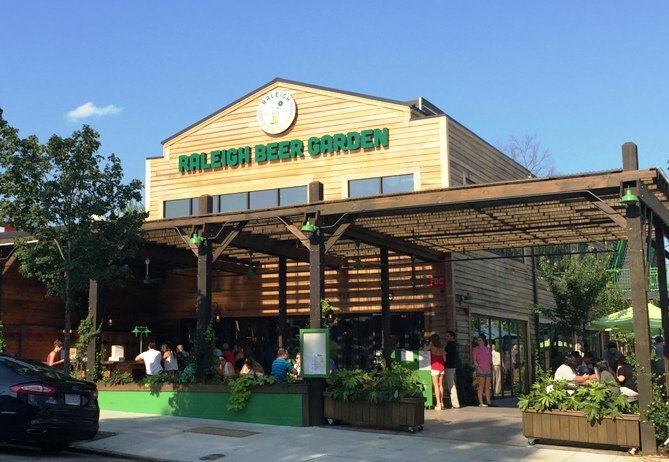 But as you can guess, the Raleigh Beer Garden is seeing some serious opening month issues. 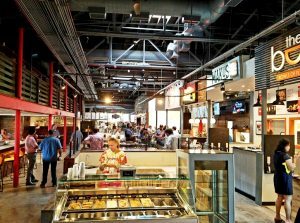 Everything from mixed service, long waits for beer, a leaky roof and more.